Over the course of five town halls, we’ve talked through just about everything but the merits of creating separate city and parish councils. Rather, we’ve mulled conspiracy theories and a botched roll-out, miring yet another attempt at achieving basic democratic rights for Lafayette city residents in a sideshow that’s equal parts failed politicking and a display of civic ignorance — one that’s left me, frankly, despondent. This idea, or some version of it, is not new. In fact, it’s a variant of an earlier proposal to create a city council within a council, which was struck down by the City-Parish Council in 2013 before it could even reach a charter commission. They called it the Fair and Focused Plan. 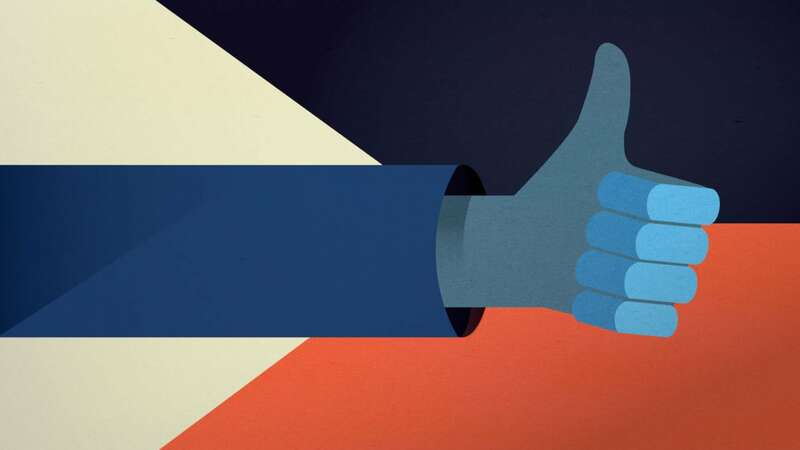 It was a compromise, a consolation to the deconsolidationistas who were humiliated at a general election in 2011 to fully dissolve consolidated government. It failed to make the ballot, sputtering at a 5-4 council vote. Some of the surnames among nays should sound familiar: Castille, Naquin, Naquin, Theriot and Bellard. Four of those five no votes were cast by “parish” councilmen. In a twist of fate, Jay Castille, a “parish” councilman, is among the sponsors of the latest attempt at autonomy for the city of Lafayette. Kevin Naquin, currently the council chairman and a parish rep, is reportedly a “yes,” while Bellard and Theriot remain “no’s,” though Bellard’s position is somewhat more flexible. The second Naquin — that would be Andy — was the swing vote those many years ago, and the representative, ironically, of District 6, the only 100 percent city district now repped by amendment co-sponsor Bruce Conque. City partisans have been after autonomy for almost a decade. Today’s push fulfills a promise to fix the charter made in the wake of those foregoing failed efforts. Even folks who opposed deconsolidation then see it that way. To be clear, this is a different proposal, even if the debate rings familiar. As originally introduced, it would create separate city and parish councils, both with five representatives, and preserve most of the remaining conundrums of consolidation. (Curiously, the one thing anyone can agree on is that consolidation is a flummoxing mess.) You’ll still have a mayor-president, elected parish-wide, who directs shared services like public works, planning and zoning, parks and rec. And by and large, the charter amendments follow from the most significant change: the splitting of the council. The unifying theme here is an appeal to basic democratic principles. Many of the amendments’ most controversial aspects are still in flux. Term limits will likely be preserved, how appointments are made to various commissions will be tweaked, districts will be redrawn. For now, we’ll focus on the broad strokes case for a split council, the headline issue of the whole affair. Taxation with representation, it’s the foundational principle of American democracy; for the city of Lafayette, it’s in jeopardy, proponents argue. The reason is pretty simple: the city of Lafayette has not grown as much as the rest of the parish over the last two decades. When consolidated government was established in 1996, the city of Lafayette commanded 57 percent of parish population, and it appeared destined to annex nearly everything around it. But that’s not what happened. Today, the city accounts for closer to 52 percent, and that’s in part due to policies enabled by consolidated government, like selling Lafayette water to Youngsville and Broussard, and runaway growth in those towns. The fear is — and at this point it’s only a fear — that Lafayette will shrink to less than 50 percent of the parish population in the 2020 census. 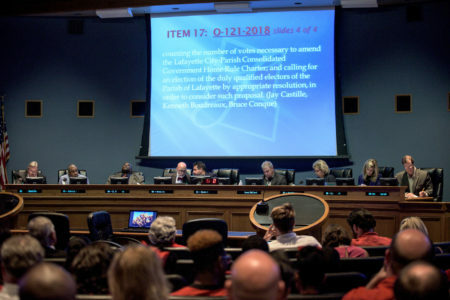 Resulting new districts would flip the city’s de facto five-seat majority on the council to the parish side, meaning representatives from outside the city of Lafayette could control the city’s budgets and policies. As written, the split council amendment would forestall that problem by seating a city council to manage city issues and a parish council to manage parish issues. Items falling in the shared purview of both jurisdictions would be handled jointly. That’s where things get a little sticky: Each council would have to marshal a majority to, say, sell a parish-owned parking garage to the city or change pay rates for Public Works employees, or approve the annual city-parish budget and cost allocation formula. When you’re in a bad situation, you take what you can get. Managing two separate councils with different priorities is onerous. Very onerous. But, from the city’s perspective, that’s a good thing. The city holds the purse strings. A de facto veto, the thinking goes, would restore the city’s bargaining power on shared costs. It’s perhaps not lost on you that Lafayette’s self-governance will be determined by everyone in the parish. That’s because, by law, everyone in the parish votes on amendments to the charter, including citizens in municipalities that are specifically not part of consolidated government. An unforeseen ramification to consolidation back in the ’90s is that the city has no control of changes to the charter it created, including decisions regarding its own form of government. Yet here we are. The charter fix does offer one cure: Charter amendments would have to be approved by majorities of both the city and the parish. While that would still mean parish voters could, theoretically, overrule a change to city government, it would provide city voters another kind of veto. “How many of you think the LUS issue and the deconsolidation issue are intertwined?” Councilman William Theriot asked with a raised eyebrow at his town hall. That’s one of those straw-man straw polls — designed to win an argument no one is having. Look, maybe there really is a conspiracy to amend the charter to ram through the mayor’s privatization of LUS, but that’s some seriously baroque, hyperdimensional chess that would be in play. Taking a broad read of Theriot’s conspiratorial question, you can’t really answer anything other than “yes, they are intertwined.” Because the issues have always been intertwined. Since the 2011 failed effort to deconsolidate, clarifying and preserving city ownership of LUS has taken center stage of the push. There’s an ambiguity in the charter as to who exactly gets final say on major LUS decisions — bond authorizations, electric and water rates, ahem, a sale of the system or any part thereof. To cover legal bases, which is what lawyers do, council practice has held that both the LPUA, the chartered governing authority of LUS, and the full council make most major decisions. That’s cockamamie. To wit: at Theriot’s town hall Monday, assistant city-parish attorney Mike Hebert offered that LPUA would have to call for a general election on a possible sale or management agreement. At Tuesday’s council meeting, the city-parish attorney, Paul Escott, informed Councilman Kenneth Boudreaux that both bodies would vote on the matter. Ask 10 lawyers, get 10 different answers. So what does that all mean? One, the charter’s kind of a hot mess. Two, the split council clarifies a problematic confusion. The full council has, in the past, overturned rate hikes and overturned LPUA decisions. Those instances are rare, but that they are possible is the fundamental problem. The split council amendments abolish the LPUA, vesting all authority over LUS into the city council only. What’s in it for the parish? Rural parish residents have seethed about government neglect at several of the town halls. From their vantage, talk of a split council is talk of abandonment. The city drains to the parish, some have said, yet the city keeps the money and the backhoes to do drainage improvements. Split the councils, and it looks like all the parish gets in the deal is tough love. So it’s fair to question whether the parish gets a raw deal in a split council arrangement. But the reality is, the parish already gets a raw deal with consolidated representation. That’s a concept perhaps best illustrated, even inadvertently, by William Theriot. I would probably say that 80 to 90 percent of fighting that I’ve done over the last 11 years on this council has been for resolutions about Lafayette the city. There’s no money in the parish. Think about that for a second. 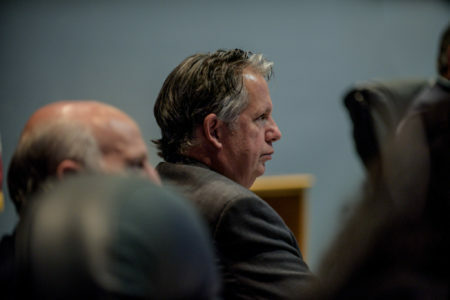 William Theriot, in defending his voting record as a parish councilman weighing in on city issues — and he has contradicted city interests, voting against its purchase of the Horse Farm from the university and voting to overturn some LPUA decisions — said that he spends almost all of his time working on city issues. That should infuriate rural parish voters. So what’s in it for parish voters? They’d get representatives who would spend 80 to 90 percent of their time on parish issues. For the record, this fix is flawed. Split councils will undoubtedly be a headache for the mayor-president to manage. As a reporter, I’ll have twice as many council meetings to attend. But it’s best evaluated on its intended merits. You could argue that it doesn’t go far enough. I’d likely join you in that opinion. Consolidated government will continue to operate with inherent conflicts as long as the mayor-president is a unified office. Just this week, the mayor created an innovation trust for the parish to finance innovation districts, jurisdictions that would attract cutting-edge business in the tech industry. The seat of technology in Acadiana is the city of Lafayette, yet if the councils split, the parish would control who runs that trust. That’s nuts. Meanwhile, the mayor is also in the process of negotiating the sale of a parish-owned parking garage to the city. Who gets the short end of that deal? Arguably the city, which is paying market value for a parking garage the parish can’t afford to maintain. Even if it’s not a cure-all, the creation of separate city and parish councils won’t prevent the consideration of yet more refinements, or ultimately, deconsolidation. So is the fix perfect? No. But neither is consolidation. Meanwhile, he’s been working in a broken government for 11 years. The delusion everyone is having is about a false sense of power. Economics will control the growth of both the incorporated and unincorporated area. And under the present and proposed plans we will get more of the same. This whole convoluted web of this “better for us” mentality, is exactly what got us here in the first place. Lafayette thought it could be the “power” even without the other municipalities going along with consolidation. and they are still saying it. The are making the same mistake again, only bigger. there is no us vs them. But, at the core of the “new/old de-consolidation of the consolidation”. That’s the entire argument. When actually, Theriots idea is, financially and democratically, the soundest idea of all. And look at what he is saying. Under his plan, the “Youngsville” citizens will have no representative voice in the city of Lafayette. period. He agrees with you, they should not have power or responsibility of having to vote on Lafayette city issues. Including LUS issues. But that is the job the voters gave him under the present consolidation plan that Youngsville opted out of. As a Youngsville representative he is tell us again, they want out. And he is treated as is its a what, sinister plan to hurt Lafayette? This is exactly the same aruguments made during “consolidation”. And just because he votes against something LPUA votes for, doesn’t mean he is voting against the city of Lafayette. Maybe, just maybe, he is voting based on his conscious. Even when I have disagreed with him, I have always found that to be true. And why not one sales and property tax, no city tax or parish taxes, one set taxes? What is the point of city limits? so some people are taxed less then others? Why? If you want infill development, urban centers, “downtowns”, municipal growth rather than sprawl, this is how you do it. It that creates the economic model to build what everybody says they want. But to get it, the city of Lafayette must give up its delusion of power over the rest of the parish. We don’t have it now and never did, never will. But soon, very soon, “they” will have it over “us”. And isn’t’ that what we are fighting now? We need to stop listening to the same old political mindset that got us here. Think outside the box. Fix the “problem”. I don’t doubt Theriot’s convictions. Nor do I think he’s wrong to vote his conscience. The question is whether he should be allowed to vote on those issues at all. That’s irrespective of how he votes. It’s worth noting that he has joined “city” councilmen on some of those votes, too. First, Theriot’s idea requires a separate City Council for Lafayette. You can’t divide up the Parish among the municipalities and not have a Lafayette City Council. 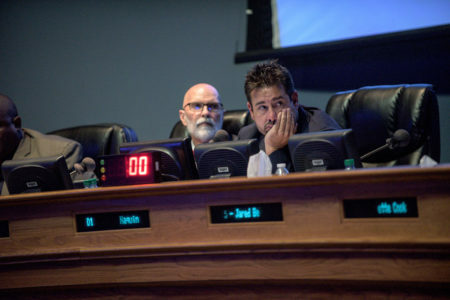 Unless the proposal is to have no unincorporated areas, but still have people from Youngsville, Broussard, etc., serving on a Lafayette City-Parish Council (which, with respect to representation, would make the City of Lafayette equivalent to an unincorporated entity – everyone in the entire Parish gets an equal say as to the governance of the City of Lafayette). In any event, by law, we would still have to maintain a Parish Council. There are certain functions of government that are required to be carried out by the Parish – mainly the obligation to fund various things. And although, in theory, the money to fund these things would come from each of the municipalities (good luck getting the municipalities to agree on who pays what), there still has to be a governing authority that authorizes it. Further, the municipalities – particularly the smaller ones – aren’t going to want to take on the financial responsibility for the roads, bridges, drainage, etc., in the areas that now comprise the unincorporated Parish. It’s not like those areas are going to turn into giant revenue generators by virtue of being annexed. Finally, Theriot’s idea would require the annexation of everyone in the unincorporated Parish into one of six municipalities. I don’t think that this is possible under state law without the consent of the residents living in those areas. So you’re not fixing the representation problem, you’re not fixing the revenue problem, it’s not politically feasible, and you’re not even allowed to do it under law. I can’t say that I’m a fan of this idea. To get change, we have to change. If the argument against the separation by municipal areas is we need to change the laws, isn’t that what they are trying to do now? Change the law. But it’s a change without change. As for incorporated area being willing to take In unincorporated areas into a single municipalities. Ask them. Theriot did and they said yes. It broadens their tax base, gives them the ability to plan for growth and reduces conflicts.